Earlier in the season I posted a recipe for basic kimchi. Perhaps it's not what immediately comes to mind when you hear the word "pickle," but pickle it is. 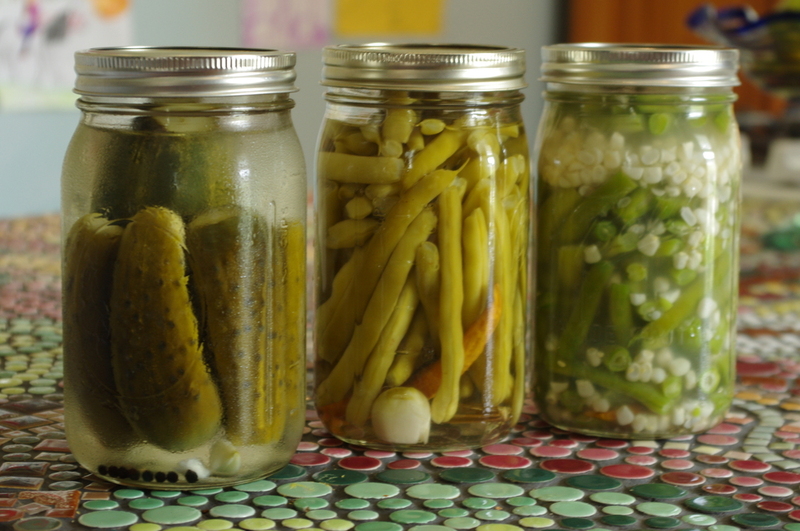 For thousands of years people have been pickling foods through the process of fermentation. The basic principle is to salt food (or soak in a salt brine), store anaerobically (without the presence of air), and leave at room temperature long enough for the lactobacillus bacteria to kill off any unhealthy bacteria. In this natural process of preserving perishables, a host of B-vitamins are produced, and the sour taste is an added bonus. At some point in history, vinegar (also a fermented product) became a main component in modern pickling. Most pickled vegetables in grocery stores have been processed with vinegar. The reason for this is that the 5% acidity in vinegar is enough to reliably and consistently kill off bacteria and anything else that would produce a food borne illness. The downside is that vinegar inhibits the growth of probiotics as well. Heat processing, or canning will further reduce the natural vitamin C content, but allows food to be preserved safely for years. This method uses the process of fermentation, while also using vinegar for flavor and faster pickling. The vinegar inhibits the growth of bacteria, so the fermentation will not be as active as a salt-only method. However a benefit to this method is that because the cucumbers are never cooked or exposed to heat processing, the natural vitamin C content is preserved. This Method uses a traditional salt and vinegar brine and water bath canning for long-storage preservation. The benefit of this method: Once canned and sealed, the jars of food do not require refrigeration and can be stored safely for years. The downside is that much of the natural vitamins are reduced in the heat-processing. Nevertheless, these pickled beans are delicious! In a 12-quart sized stock pot with lid and rack (a small aluminum disc with holes for raising jars slightly off the bottom surface of the pot), or water bath canner; boil about 10 quarts of water. Have a second pot of boiling water available for topping up when you are ready to seal the jar. Sterilize a quart-size mason jar and lid (wide-mouth is easier for this recipe). Place the salt, cayenne hot pepper, garlic clove, peppercorns and dill in the bottom of the jar. Pack the beans in the jar as tightly as possible. You can stand them all upright if they are whole, or cut them into pieces. Combine the vinegar and water in a small saucepan and boil. Pour the vinegar and water mixture into the filled jar, leaving 1/2 inch head space. Place lid and band on the jar, tightening to fingertip tight. Using a canning jar lifter, place the jar of beans into the large pot of boiling water. Top up with enough boiling water to cover the jar of beans entirely. Place lid on the pot of boiling water and set timer for 5 minutes, (10 minutes if you are at an elevation of 1,001 ft or greater above sea level, 15 minutes if above 6,000 ft). Once processing time is done, carefully remove jar with the canning jar lifter and place it on a cloth. Let cool completely before checking that it is sealed. Remove band and wipe away any moisture. Store in a cool, dark place for at least 6 weeks before opening and tasting. This is a traditional salt brine fermentation. The corn and beans are blanched before brining to make the texture a little softer, but that step is not required. This method makes the most of the natural pickling process. Lactobacilius bacteria (present in the vegetables), converts sugars into lactic acid, which preserves the vegetables. This process also produces B vitamins, while also preserving Vitamins C and A that are at their highest in raw vegetables. Clean two quart-sized canning jars and their lids and place a clove of garlic and a cayenne pepper in each clean jar. In a large bowl combine two quarts of water and 4 Tbs of pickling salt. Set aside. Boil a large pot of water. Place ears of shucked and cleaned corn into the water for about 1-3 minutes to blanch (depending on how soft you like the corn), but not too long. You don't want to kill the good bacteria inside the corn kernels. Remove the corn from the boiling water and dunk it into a bowl of ice water until cold. Next place the beans in the boiling water for about 30 seconds, or until they turn bright green. Remove beans from the boiling water and place them in the bowl of ice water until cool. Drain. Cut the corn kernels off the cob. Place the beans and corn kernels in the bowl of salt brine. Mix and let rest for about 15 minutes. Using a canning funnel over each jar, scoop the beans and corn out of the brine solution and fill the jars snugly, leaving an inch or two of space at the top. Pour some of the brine into each jar until the beans and corn are completely covered. Place lids on the jars and store at room temperature for 1-6 weeks. Open the jars every day or so to check that they are fermenting and to press the beans and corn back down into the brine. You can taste along the way to see if they are sour enough. Once they are done to your liking, you can eat right away, or store the jars in the refrigerator for several months.